Erarta became a winner of Trip Advisor Certificate of Excellence! 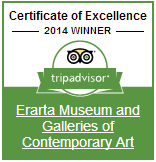 We are happy to share with you our great news: Erarta Museum has received Trip Advisor Certificate of Excellence! We are pleased and proud to announce that Erarta became a winner of Certificate of Excellence by Trip Advisor, the world's largest website for travelers. This award is our great honor and motivation to move on. It's not the first time Trip Advisor awards Erarta Museum: we received certificates for outstanding traveler reviews in 2012 and 2013, and hit Top 10 Russian Museums in 2013. Because of you, dear guests, we strive to improve and move forward every single day! So we'd like to thank everyone who finds a moment to write a few good words about our museum. It is important for us to understand that we are developing in the right direction. This is why your feedback, critics and offers are so crucial. Looking forward to seeing your new reviews!